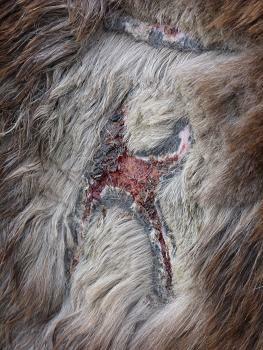 Ear mutilations - Ear notching, ear cutting (as shown in the photo) and ear tagging are practises that wild ponies in the UK had been routinely subjected to as a means of identification. 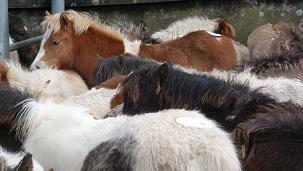 Most of the traumatised ponies in our care had been subjected to mutilating ear procedures. In 2010, people4ponies discovered that ear notching, ear cutting and ear tagging of ponies had been made illegal in 2007, but it was still continuing unchallenged on the moors in our region. With the help of the British Veterinary Association, British Equine Veterinary Association and local authorities, we were able to finally stop this practice across the UK. Owners who persist can be prosecuted under the Animal Welfare Act. Hot Branding - is the single or repeated application of a red hot iron to the skin of a horse or pony. It is a traditional method of identifying wild ponies. Not only is this process painful and ineffective, but as a charity we specialise in handling ponies that are traumatised by their experience of the process and are too frightened to find “normal” homes. People4ponies believes that brands are an unreliable, unnecessary form of identification and that branding does not improve the welfare of the ponies; in fact the handling, restraint and branding is detrimental to the overall welfare and future of the ponies. A UK ban on equine hot branding is supported by the British Veterinary Association, British Equine Veterinary Association, The Blue Cross, The British Horse Society and the RSPCA as well as p4p. It has already been banned in Scotland, Northern Ireland, Denmark, Sweden, The Netherlands and Germany. Wild Pony Markets - Each autumn, we attend the wild pony markets in the South-West. When we started attending markets in 2010, there was great variation in the welfare standards at the markets. Some failed to adhere to the law and regulations provided to protect animals at sales. 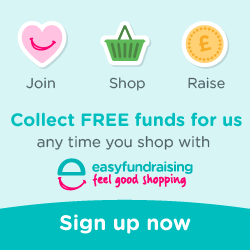 Recent cuts in local authority funding has meant that it has been more difficult for the authorities to attend all the sales. Since we started attending and monitoring sales, we have seen welfare standards greatly improve. The scale of overbreeding on the moors is still effectively out of control. The failure to remove stallions from the moor to control breeding, means that foals are born in the spring only to be slaughtered in the autumn. 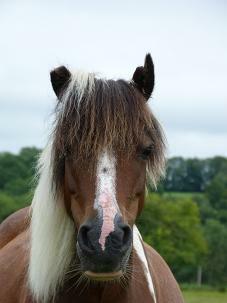 With the current equine crisis in the UK, breeders should be responsible and stop breeding unwanted animals.